Currently widely used CNC machining tool materials include diamond tools, cubic boron nitride tools, ceramic tools, coated tools, carbide tools and high-speed steel tools. There are many grades of tool materials, and their performance is also very different. The main performance indicators of the various tool materials are as follows. Tool materials for CNC machining must be selected based on the workpiece being machined and the nature of the process. The selection of tool materials should be matched with the processing object. The matching of cutting tool materials and machining objects mainly refers to the matching of mechanical properties, physical properties and chemical properties of the two to obtain the longest tool life and maximum cutting processing productivity. The mechanical property matching problem between the cutting tool and the machined object mainly refers to the mechanical property parameters such as the strength, toughness and hardness of the tool and the workpiece material. Tool materials with different mechanical properties are suitable for machining workpiece materials. 1. The hardness sequence of the tool material is: diamond tool > cubic boron nitride tool > ceramic tool > hard alloy > high speed steel. 2. The bending strength order of the tool materials is: high speed steel > hard alloy > ceramic tool > diamond and cubic boron nitride tool. 3 The toughness order of the tool materials is: high speed steel > hard alloy > cubic boron nitride, diamond and ceramic tools. High hardness workpiece materials must be processed with higher hardness tools. The hardness of the tool material must be higher than the hardness of the workpiece material. Generally, it is required to be above 60HRC. The higher the hardness of the tool material, the better its wear resistance. 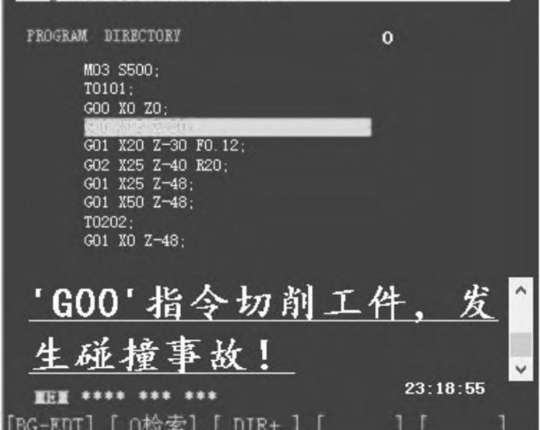 For example, when the amount of cobalt in the cemented carbide increases, the strength and toughness increase, the hardness decreases, and it is suitable for rough processing; when the amount of cobalt decreases, the hardness and wear resistance increase, which is suitable for finishing. Tools with excellent high temperature mechanical properties are especially suitable for high speed machining. The excellent high temperature performance of ceramic tools enables them to be cut at high speeds, allowing cutting speeds to be 2 to 10 times higher than cemented carbides. Tools with different physical properties, such as high-speed steel tools with high thermal conductivity and low melting point, ceramic tools with high melting point and low thermal expansion, diamond tools with high thermal conductivity and low thermal expansion, are suitable for processing workpiece materials. 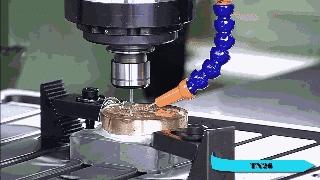 When machining a workpiece with poor thermal conductivity, a tool material with better heat conductivity should be used to allow the cutting heat to be quickly transmitted to lower the cutting temperature. Due to the high thermal conductivity and thermal diffusivity of diamond, the cutting heat is easily dissipated and does not cause large thermal deformation, which is especially important for precision machining tools with high dimensional accuracy. 1. Heat resistance temperature of various tool materials: 700~800°C for diamond cutters; 1300～1500°C for PCBN cutters; 1100～1200°C for ceramic cutters; 900～1100°C for TiC(N) based cemented carbides; WC base The ultrafine grained cemented carbide is 800 to 900 ° C; the HSS is 600 to 700 ° C.
2. 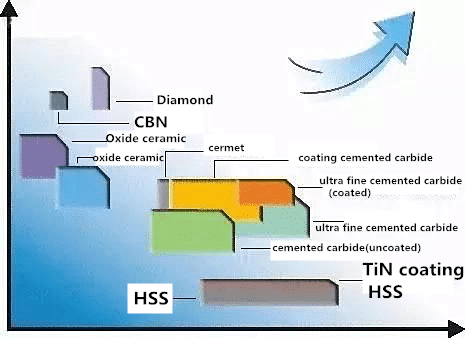 Thermal conductivity sequence of various tool materials: PCD>PCBN>WC-based hard alloy>TiC(N)-based cemented carbide>HSS>Si3N4-based ceramic>A1203-based ceramic. 3. The order of thermal expansion coefficient of various tool materials: HSS>WC based hard alloy>TiC(N)> A1203 based ceramic>PCBN>Si3N4 based ceramic>PCD. 4. The order of thermal shock resistance of various tool materials: HSS>WC-based cemented carbide>Si3N4-based ceramic>PCBN>PCD>TiC(N)-based cemented carbide>A1203-based ceramic. The matching of the chemical properties of the cutting tool material with the processing object mainly refers to the matching of the chemical properties of the tool material with the chemical affinity, chemical reaction, diffusion and dissolution of the workpiece material. The materials of the workpieces that are different for different materials are different. 1. 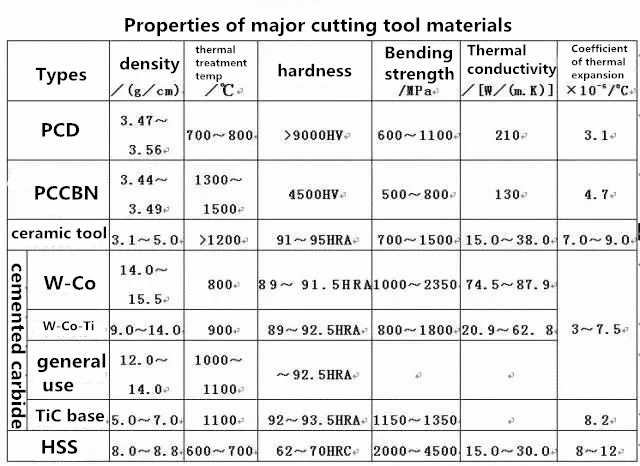 Anti-bonding temperature of various tool materials (with steel): PCBN>Ceramic>Carbide>HSS. 2. Anti-oxidation temperature of various tool materials: ceramic>PCBN>hard alloy>diamond>HSS. Diffusion strength of three kinds of tool materials: for steel, diamond>Si3N4 based ceramic>PCBN>A1203 based ceramic; for titanium, A1203 based ceramic>PCBN>SiC>Si3N4>diamond. The hardness of the tool material must be higher than the hardness of the workpiece material, generally required to be above 60HRC. In general, the higher the hardness of the tool material, the better the wear resistance. The cutting part of the tool is subject to large cutting forces and impact forces. Therefore, the tool material should have high strength and toughness to withstand cutting forces, shocks and vibrations, and prevent brittle fracture and chipping of the tool. At high temperatures, the tool can maintain its hardness and strength. The better the heat resistance, the stronger the ability of the tool to resist plastic deformation and the anti-wear ability at high temperatures. The better the thermal conductivity, the easier the heat generated during cutting is conducted. , thereby reducing the temperature of the cutting portion and reducing tool wear. For ease of manufacture, the tool material should have good machinability, including hot workability, machinability, and grinding performance, so as to pursue high cost performance. In general, PCBN, ceramic tools, coated carbide, and TiCN-based carbide tools are suitable for CNC machining of ferrous metals such as steel.PCD tools are suitable for non-ferrous materials such as Al, Mg, Cu and related alloys. 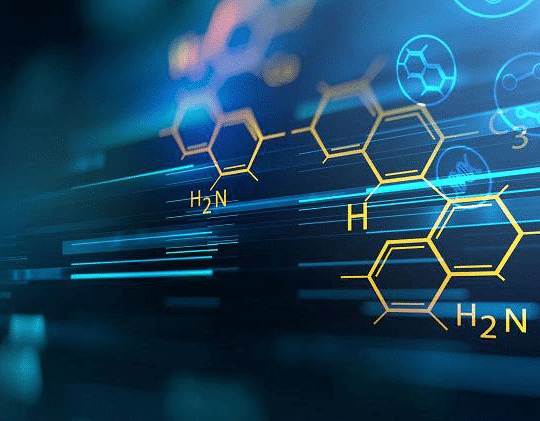 Processing of non-metallic materials. 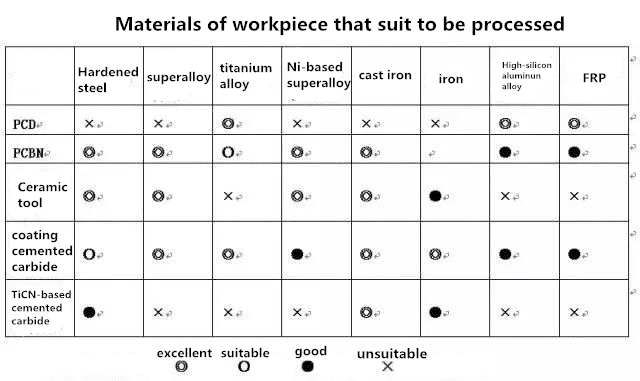 The table below shows some of the workpiece materials that are suitable for machining various tool materials.